We have A LOT of extra lace from all the tree skirts we made this past holiday season. In effort to dispose of it wisely, I decided to use some to decorate my baby girl's room. Here is my very simple, yet lovely way of framing lace. 1. Spray paint some old picture frames... check out our "how to spray paint a picture frame tutorial", HERE. 2. Hot Glue some lace into the picture frame. 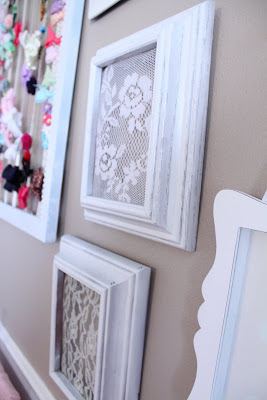 It is so easy, yet adds just the right touch to my little girl's shabby chic nursery! I have thought about framing the her little dress as well? What do you think? I am also on the hunt for a prettier hanger... any suggestions there? Oh and I couldn't resist hanging my thrifted lace curtains that I bought for $2!! Just lovely! Did you make the hair bow holder? I really want to make one for both of my girls, but was looking for just the right one and yours is adorable! Those are too sweet. I want some for my room :) I love the bow holder as well. Love the frames, they look so sweet with everything on her wall. I think the dress would look adorable inside an empty white frame, and I'm sure you'll come up with a cute hanger! I love what you have done here. Wonderful Makes me want another little baby, but that is not going to happen. LOL Maybe you could make your own hanger or take a hanger and pad/decorate it. So pretty! I have a couple of lace door panels I can't use. I must get brave , cut them and try this .. Thanks! Found you through Pinterest.